The heat pump unit is delivered complete with instrumentation and includes technical and instruction manuals. 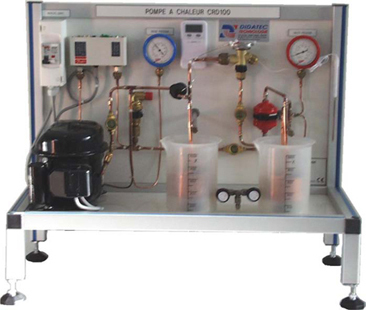 It is made up of a hermetically sealed compressor with a piston, a condenser and a coil shaped evaporator. Two water tanks allow for the measurement of temperature during condensation and evaporation. The instruments enable one to read the pressures in various parts of the circuit as the refrigeration fluid goes through liquid and gaseous phases. These measurements allow for the calculation of heat exchanged at various points. Function of a heat pump and its different components. MOLLIER diagram use (refrigerant R134 a). Construction of the refrigeration cycle (H-logP).